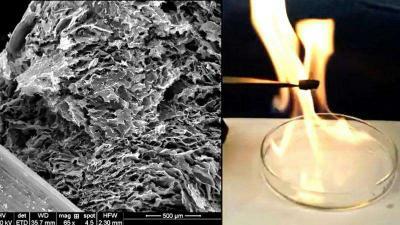 A collaboration work by Purdue, the Chinese Lanzhou University and Harbin Institute of Technology, and the U.S. Air Force Research Laboratory has yielded a lightweight, flame-resistant and super-elastic composite shown to combine high strength with electrical conductivity and thermal insulation, suggesting potential applications from buildings to aerospace. The composite material is made of interconnected cells of graphene sandwiched between ceramic layers. The graphene scaffold, referred to as an aerogel, is chemically bonded with ceramic layers using a process called atomic layer deposition. The team explained that graphene would ordinarily degrade when exposed to high temperature, but the ceramic imparts high heat tolerance and flame-resistance, properties that might be useful as a heat shield for aircraft. The light weight, high-strength and shock-absorbing properties could make the composite a good substrate material for flexible electronic devices. Because it has high electrical conductivity and yet is an excellent thermal insulator, it might be used as a flame-retardant, thermally insulating coating, as well as sensors and devices that convert heat into electricity, said associate professor in the School of Industrial Engineering at Purdue University. The researchers attribute their achievement to designing a hierarchical honeycomb microstructure assembled with multi-nanolayer cellular walls serving as basic elastic units. This material, they say, demonstrates a sequence of multifunctional properties simultaneously that have not been reported for ceramics and ceramics–matrix–composite structures.